A set of furniture for your scenes. 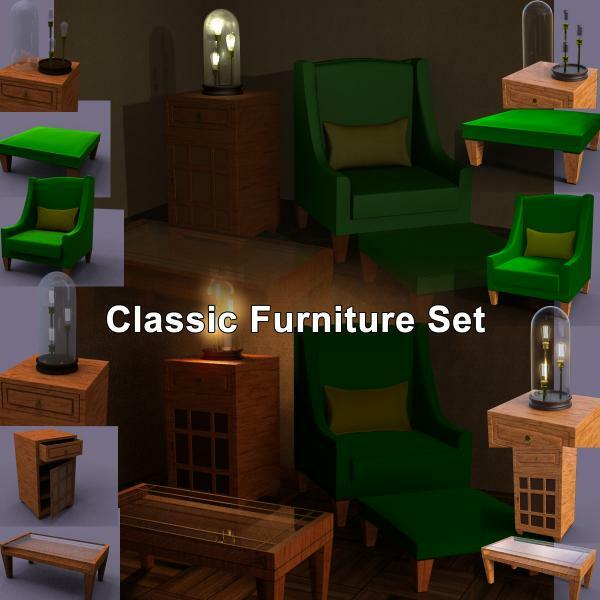 An Arm Chair, Ottoman, Coffee Table, Small Cabinet, and Accent lamp with removable Glass dome. The Cabinet is rigged, and there are material presets for Iray AND 3DL. Properly scaled for DAZ's figures. In the Iray render, I used the following Bloom settings: Bloom Filter Radius .09 and Bloom Filter Threshold 10,000. In the 3DL render I used three point lights in the bulbs set to 5% intensity. Extract to your My Library folder, and please let me know if you have any issues. Divamakeup (2 years ago) Inappropriate? nobody1954 (2 years ago) Inappropriate? CHACORNAC (2 years ago) Inappropriate?